Fake Weather. How Long Will TV Weather Reports Pretend Everything Is Normal? According to researchers with the Northwest Territories Geological Survey, the permafrost collapse is intensifying and causing landslides into rivers and lakes that can choke off life downstream, all the way to where the rivers discharge into the Pacific Ocean. Similar large-scale landscape changes are evident across the Arctic including in Alaska, Siberia and Scandinavia, the researchers wrote in a paper published in the journal Geology in early February. The study didn't address the issue of greenhouse gas releases from thawing permafrost. But its findings could help quantify the immense global scale of the thawing, which will contribute to more accurate estimates of carbon emissions. 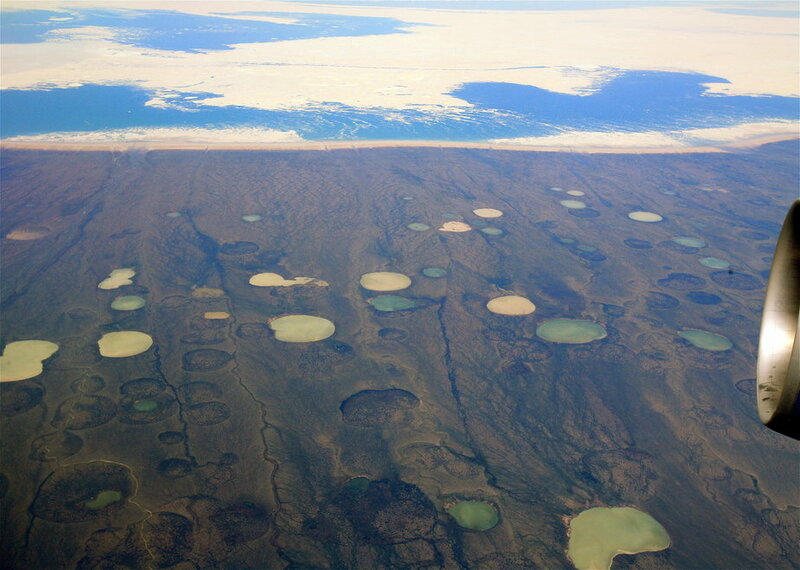 Permafrost is land that has been frozen stretching back to the last ice age, 10,000 years ago. As the Arctic warms at twice the global rate, the long-frozen soils thaw and decompose, releasing the trapped greenhouse gases into the air. Scientists estimate that the world's permafrost holds twice as much carbon as the atmosphere. The new study was aimed at measuring the geographical scope of thawing permafrost in northwest Canada. Using satellite images and other data, the team studied the edge of the former Laurentide Ice Sheet, a vast expanse of ice that covered two-thirds of North America during the last ice age. The disintegration of the permafrost was visible in 40- to 60-mile wide swaths of terrain, showing that, "extensive landscapes remain poised for major climate-driven change." "Things have really taken off. Climate warming is now making that happen. It's exactly what we should expect with climate change," said Steven V. Kokelj, lead scientist on the Canadian mapping project. "And the maps that we produced clearly indicated it's not just a random pattern. We're sort of connecting dots here for the scientific community." Other global evidence of similar large-scale permafrost changes have recently been documented in Siberia, where scientists with the Permafrost Laboratory at the University of Sussex (UK) are monitoring another rapidly growing scar in the earth. More than a half-mile of once-frozen ground has collapsed 280-feet deep, according to their study published in in the journal Quaternary Research in February. The researchers said they expect to see the rolling tundra landscape transform, including the formation of large new valleys and lakes. Similar signs are evident in coastal Arctic areas, where thawing permafrost and bigger waves are taking 60- to 70-foot bites of land each year, according to researchers with the Alfred Wegener Institute for Polar and Marine Research. Writing in the journal Nature Climate Change in January, AWI scientists warned about collapsing coastlines and urged more research, with input from policymakers and native communities. University of Alberta scientists Suzanne Tank, who was not involved in the new study, said that the release of sediments from the new slumps in the Canadian permafrost has significant ecological implications. The pulses of silt, mud and gravel make streams murkier and limit growth of aquatic plants at the base of the food chain. Exactly how that affects other species, including fish, is the subject of ongoing research. Scientists know thawing permafrost unlocks carbon. But according to Tank, most of the carbon in the Canadian melting is being released quickly as coarse particles that aren't converted to CO2 immediately. But separate research by Swedish scientists suggests that the soil particles are quickly converted to heat-trapping CO2 when they are swept into the sea. A series of studies on the National Institute of Health's Arctic Health website documents how the widespread thaw of permafrost is already having direct impacts on people. Warmer water and increased sediment loads are harming lake trout, an important source of food for native communities. Changes to the land surface are also disrupting caribou breeding and migration, and in some places, the disappearing permafrost has destroyed traditional food storage cellars, researchers have found. At lower latitudes, permafrost is the glue that holds the world's highest mountains together by keeping rocks and soil frozen in place. Scientists are documenting how those bonds are dissolving, said Stefan Reisenhofer, a climate scientist with the Austrian Bureau of Meteorology and Geodynamics. "We've seen a significant reduction in the number of ice days (those with 24 hours of sub-freezing temperatures), especially in the summer months," said Reisenhofer, who works at a climate observatory at an elevation of 8,500 feet. "From 2010 to 2014, the number of ice days decreased by 11 in May, and 10 in June." During that span, the mountain beneath the research station crumbled, requiring a huge investment to stabilize the outpost, he said. Using satellite images from the European Space Agency's Copernicus program, the Austrian researchers have shown how, similar to the findings in Canada, thawing permafrost has unleashed huge amounts of sediments below receding glaciers. Intensifying summer rainstorms have triggered huge landslides, damaging roads, power lines and water infrastructure, according to a recent evaluation of satellite images by Austrian climate researchers. In some areas, there are new restrictions on development as the landslides grow bigger, reaching all the way to the valley floors.